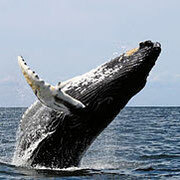 Marine biology is the scientific study of organisms in the ocean or other marine or brackish bodies of water. Marine Biology classifies organisms based on the habitat which they live in rather than the organism's taxanomic classification. 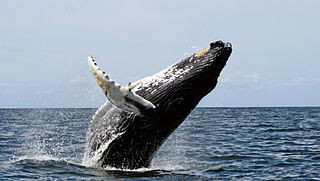 Marine biology covers a large array of organisms, from the microscopic, including most Zooplankton and Phytoplankton to the huge cetaceans (whales) which reach up to a reported 30 meters in length. 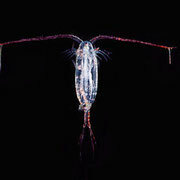 One of the smallest marine organisms a Copepod and one of the largest a Humpback whale. CCBY from Wiki commons. 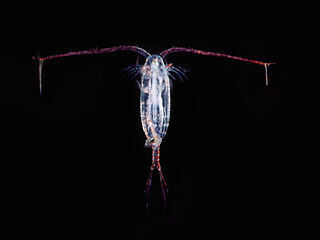 At a fundamental level, marine life helps determine the very nature of our planet. Marine organisms contribute significantly to the Oxygen cycle, and are involved in the regulation of the Earth's climate. The marine biology of Australian waters can be generally divided into two major zones based on the water temperature range, these are the tropical and temperate zones. 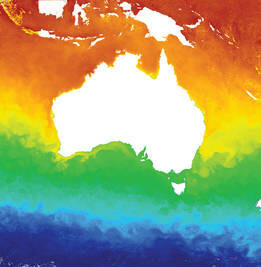 The Temperate waters of Australia extend south of the Tropic of Capricorn. There are regions of overlap where both temperate and tropical species can be found. The Tropical regions of Australia are home to tremendous variety of beauty, form and colour. 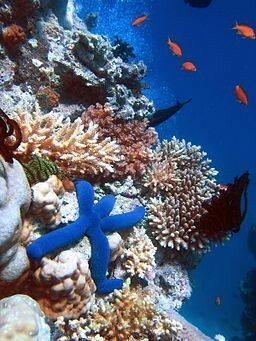 The magnificent beauty of the Great Barrier reef (and Ningaloo Reef) has fascinated many generations of Australians. 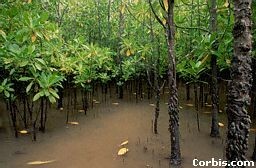 In contrast the dark muddy and mostly stagnant Mangrove forests of tropical Australia are less attractive and less known to us all yet they play an important role in the overall tropical ecosystem. The tropical marine communities of Austalia are dominated by coral reefs and Australia has the second largest extension of coral reefs at 48,960 square km, after Indonesia, of any country globally. The temperate zones of Australia are considerably less diverse than the northern tropical regions however the temperate regions have many more endemic species than the tropical regions. Typical marine invertebrates of the temperate zones of Australia. Images from www.ausinverts.com.au. A habitat is the environment within which an organism is normally found. A habitat is characterized by the physical characteristics of the environment and/or the dominant vegetation or other stable biotic characteristics. 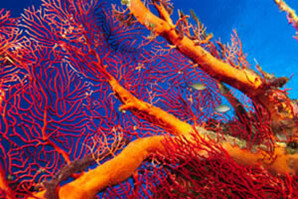 Marine Biology studies habitats such as coral reefs, kelp forests, tidepools, muddy, sandy and rocky bottoms, and the open ocean (pelagic) zone, where solid objects are rare and the surface of the water is the only visible boundary. Marine habitats can be divided into three general categories, these are the Benthic, Demersal and Pelagic zones. The benthic zone is the ecological region at the lowest level of a body of water such as an ocean or a lake, including the sediment surface and some sub-surface layers. Organisms living in this zone are called benthos. The habitats of the benthic zone vary widely depending on how far below the surface the bottom lies. Just beyond the intertidal zone, the shallow water receives ample sunlight and oxygen. Continuing down along the continental slope, the environment becomes increasingly dark and cold, and the pressure increases. A remarkable variety of organisms live in these different habitats, each with specialized adaptations reflecting the conditions of their environment. The environmental conditions within a habitat have a direct influence on the biology of resident organisms. The main food sources for the benthos are algae and organic runoff from land. Benthic organisms, such as sea stars, oysters, clams, sea cucumbers, brittle stars and sea anemones, play an important role as a food source for fish and humans. Sub divisions of the Pelagic zones. 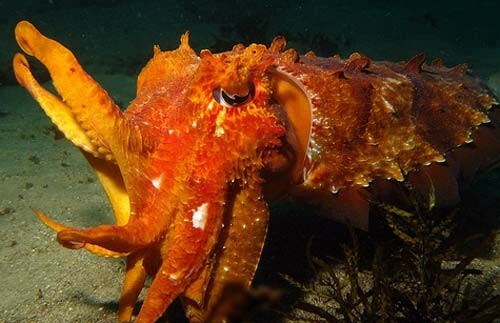 Copyright Marine Science Australia, all rights reserved. 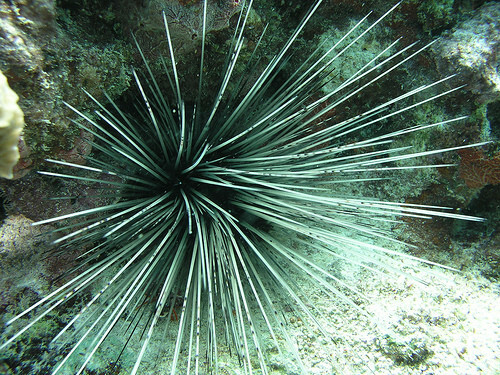 The pelagic zone habitats are within the water column, extending down from the water surface. The pelagic zone occupies 1,330 million cubic kilometres with a mean depth of 3.68 kilometres and maximum depth of 11 kilometres. Fish that live in the pelagic zone are called pelagic fish. Pelagic life decreases with increasing depth. It is affected by light intensity, pressure, temperature, salinity, the supply of dissolved oxygen and nutrients, and the submarine topography. Ecology is the study of the relationships between organisms and with their natural environment. Marine ecology is simply ecology applied to marine biota and the marine environment. Martinez, M.I., Intralawan, A., Vazquez, G., Perez-Maqueo, O., Sutton, P. and Landgrave, R. (2007). The coasts of our world: Ecological, economic and social importance. Ecological Economics 63: 254-272. Lawrence E. and Henderson W.D. (2005), Henderson’s dictionary of biology, Eleanor Lawrence. 748pp. http://en.wikipedia.org/wiki/Benthic_zone , Creative Commons Attribution-ShareAlike 3.0 Unported License (“CC BY-SA”). http://en.wikipedia.org/wiki/Demersal_zone , Creative Commons Attribution-ShareAlike 3.0 Unported License (“CC BY-SA”). http://en.wikipedia.org/wiki/Pelagic , Creative Commons Attribution-ShareAlike 3.0 Unported License (“CC BY-SA”).